Kochi:ACC Limited, one of India's leading producers of cement and ready-mix concrete immediately stepped in with resources, manpower and logistical support to provide on-ground relief and rehabilitation to assist people and local authorities in the flood impacted regions of Kerala. Mr.Neeraj Akhoury, Managing Director and CEO of ACC Limitedalong with Mrs.Seema Akhoury visited Kerala on 31.08.2018 to take hands-on review of the mass relief work and rehabilitation activities undertaken by the Company in the Flood affected areas of Kerala. On his arrival in Cochin, he first visited the Rajashree S.M.M. 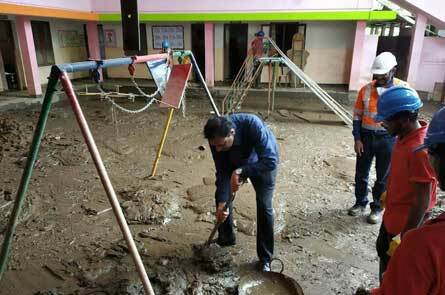 Senior Secondary School, East Kadungalloor where the Madukkarai Task Force team were fully engaged in cleaning & restoration of the mess created by the floods. He followed it up by visiting Sree Sai Vidya Vihar, Kadungalloor where ACC team had already completed the restoration work last week. He interacted with the Principal's of both the Institutions and they were in full praise for the humanitarian work carried out by the ACC team, especially the Madukkarai Task Force team. Commenting on the situation, Neeraj Akhoury said, "We salute the spirit of the people of Kerala for their resilience, courage and sheer determination as they face one of the most daunting times. ACC is making every effort to contribute to the relief and rehabilitation of the State. But going far beyond financial contribution, teams of ACC employees are on ground in Kerala, ensuring that we use ACC's resources to help create an impact to the lives of affected people and lead the rehabilitation efforts from the front. I am also proud of our family of Dealers and CFAs who are working with us shoulder to shoulder. We will continue to support the people of Kerala in the coming days." After this session, he visited Neduvannur area in Parambayam, Alwaye where lot of families were badly affected by the flood. He met a few of such families and distributed relief kits to them. Thereafter, he visited the distribution center in Vennala where the relief materials were stored and packing activities were going on in full swing. He interacted with the vibrant student volunteers from Savitribai Phule College of Social Work, Yavatmal as well as company officers, appreciated the team effort and gave further guidance. 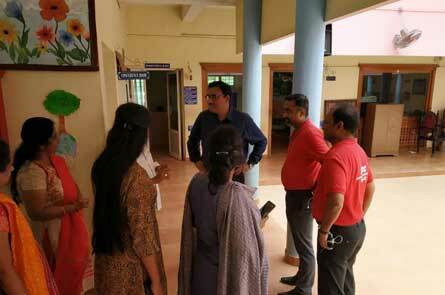 His visit concluded with a review with the Core team at the Helpline Centre set up in Sales Unit, Cochin. All the activities carried out so far were reviewed and way forward was discussed in detail. He emphasised ACC's commitment towards rebuilding a new Kerala and stressed the need to plan a long term strategy . ACC sent teams of carpenters, plumbers, electricians and maintenance personnel from its plant in Madukkarai, Tamil Nadu to Kerala. Displaced people in Kerala have been finding it difficult to go back to their homes due to the heavy mud deposit inside their homes, disrupted electricity and water supply and damage to household items such as furniture, clothes and kitchen utensils. ACC teams of maintenance workers are helping them with the removal of mud deposits, restoration of electricity and plumbing facilities. A Mobile Maintenance Van unit from its Madukkarai(Coimbatore) plant was despatched with equipment for welding, plumbing, electric work and cleaning equipment and is visiting various sites in the State. If anyone need any helps that mentioned above, can contact us through 8129051918 & 0484- 2371330. ACC's corporate commitment to communities is emblematic of the brand - beginning from the company's first Village Improvement Scheme in 1944. Throughout its 82 year history, corporate responsibility has been integral to the Company's vision. The journey continues. ACC Limited, a member of the LafargeHolcim Group, is one of India's leading producers of cement and ready mixed concrete. It has over 7,400 employees, 17 cement manufacturing sites, 62 concrete plants and a nationwide network of over 50,000 retail outlets to serve its customers. With a world-class R&D centre in Mumbai, the quality of ACC's products and services, as well as its commitment to technological development, make it a preferred brand in building materials. Established in 1936, ACC is counted among the country's 'Most Sustainable Companies' and it is recognized for its best practices in environment management and corporate citizenship.